Imagine what it would be like to climb to the top of a pillar in the blazing sun, surrounded by thousands of vaquilleros (partygoers) all cheering you on. It´s early July in Spain, the crowd is soaked in sangría and they´re bellowing for you to continue. You waive the red pañuelico (handkerchief) faithfully in the air for all to see; the mob goes wild. Then you place it around the tiny statue of a bull, a sign that marks the beginning of the festivities. Again, the crowd goes mad! It´s La Vaquilla. Although San Fermín, better known as the "Running of the Bulls" in Pamplona, became popular when Ernest Hemingway wrote about it in The Sun Also Rises, very few have ever heard of another remarkable event in Spain called La Vaquilla del Ángel. Celebrated in Teruel, which is the capital city of the province Teruel, this festival occurs on the second Sunday after St. Peter's or the Sunday closest to St. Christopher's. It pays homage to the Ángel Custodio (Guardian Angel) and the foundation of the city. 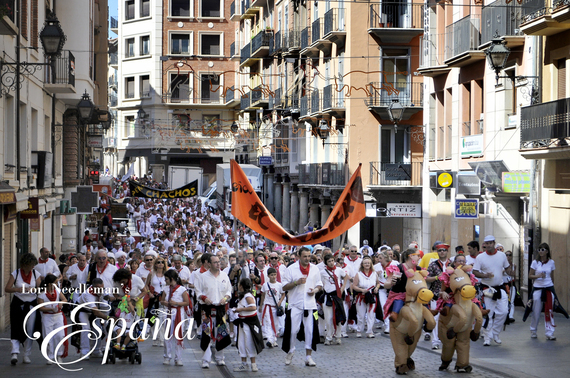 Considered by most Turolenses (inhabitants from Teruel) as their favorite "traditional" festival, there´s very little conventional about it nowadays. 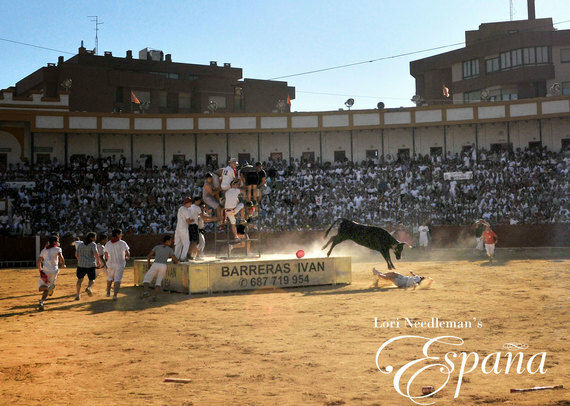 The week prior, there is regional dancing, music concerts, bullfighting and exhibitions. However, the most celebrated part of the fiesta begins on the Saturday closest to July 10th and lasts until Monday. These three days become a very "intimate" reunion with spectacular events like the running of the bulls in the city center and La Merienda in the Plaza de Toros (bullring). To most participants, the festival is an annual ritual to rid their bodies of the evil stress of every day life. For three wild days and nights, they take their physiques to the limit with non-stop partying. There is a sense of freedom in the air. What Happens in Vaquillas, Stays in Vaquillas. At 11:30 in the morning, people gather at the Ayuntamiento (City Hall) to sing Salve Regina (Hail Holy Queen) honoring Ángel Custodio. Afterwards, the Vaquillero del Año (Participant of the Year) is appointed, followed by a public auction, which includes the sale of box seats for Sunday´s eye-catching event at the Plaza de Toros. In the afternoon, the twenty peñas (clubs), along with their charangas (bands), make their way around the city center, finally arriving in the heart of the city, Plaza del Torico, forming an assembly. There´s not one inch of space left to stand, so packed is the plaza with celebrants. Waiting for the mayor to declare the opening of the fiesta, the partiers bake in the scorching sun. From balconies around the square, people pour buckets of water below to help cool the crowd. The sound of drums and brass instruments can be heard as people cheer with excitement and large beach balls are thrown around in a frenzy. The festival officially begins at 4:30 in the afternoon with El toque del Campanico when the mayor rings the campanico (bell) and says "¡¡Vaquilleros! !, ¡¡La Vaquilla va a empezar!!! ¡¡Viva La Vaquilla!!! ¡¡¡Que suene el Campanico!!!" from the balcony of City Hall. The mayor then hands the pañuelico to a hero chosen by the Asociación de Interpeñas who runs through the crowd to the Plaza del Torico, climbs to the top of the Torico pillar and ultimately places the red handkerchief around the Torico (little bull). Saturday night, people tour the different peñas, each featuring tents with fully stocked bars, food, and music. Over the three-day fest, a variety of typical Spanish food is eaten such as jamón serrano (cured ham), sausages, beans, cheese, paella, chocolate and churros. All weekend long, the charangas play their instruments as vaquilleros, who are dressed in white and red, follow behind dancing a sort of two-step movement called Paso Vaquillero. After a long night of partying, festivities don't begin again until after lunch when the peñas parade through the streets from the city center to the Plaza de Toros in silly costumes for La Merienda. Once in the bullring, they prance around, showing off their ensembles. At 6:00 in the afternoon, heifers are let loose, and those brave enough dodge them in a comedic, sometimes nerve-racking dance while the spectators cheer them on. Next, everyone has an afternoon merienda (snack), and then the bulls that will run the following day are let loose in the bullring while professionals taunt them. As night falls, the vaquilleros make their way back to the city center to party until daybreak. At 5:30 in the morning, the bulls for the run are led by two ropes from the bullring to the city center. Called La salida del toro, people get up close to meet their nemeses as they are taken to a corral. There the bulls will wait to face the anxious crowd later. 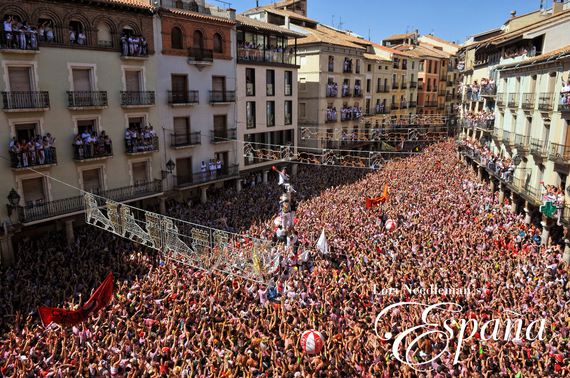 Before 6:00 in the afternoon, participants fill up the Plaza del Torico for the running of the bulls. In Teruel, a bull is tied to a rope and held by twenty-six trained men. The bull is allowed some distance and runs valiantly through the streets. Those courageous enough provoke him by dancing close and then running away timorously as the beast becomes agitated and charges. At times, a few brave souls have to save their amigos (friends) from being hit. Adrenaline runs wild and hearts pound -- facing a 1,000 lb. bull can be electrifying as well as frightful. But not to worry -- the balconies overhead are safe places for the less adventurous ones to watch! The party ends around midnight on Monday as the peñas and charangas march from their meeting places to the Plaza del Torico. The last and final indication that the party is over happens when our hero climbs back up to the top of the pillar and removes the pañuelico from the little bull. A dazzling firecracker display lights up the plaza and those who have survived the weekend sing the farewell anthem, which ends the festival. The Tuesday after the festival is known as "Martes de dolores," which translates as "Sorrowful Tuesday." On this day, the city is absolutely dead and everyone sleeps off the consequences of their foolish actions. 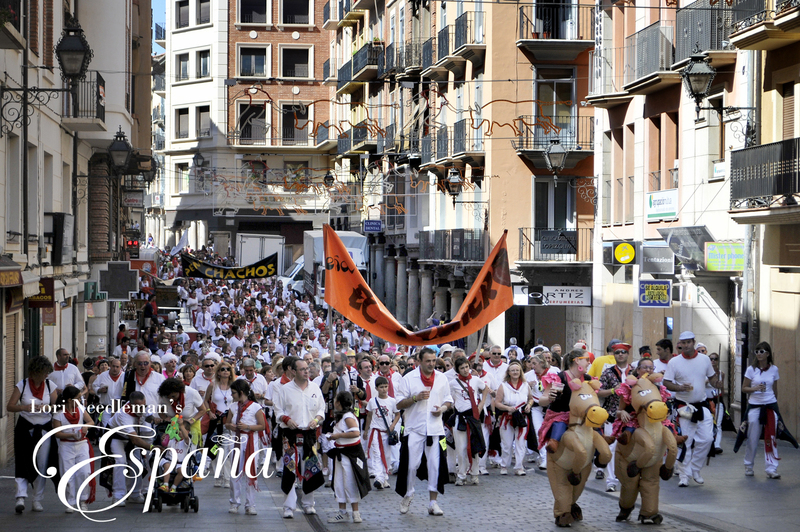 So, the next time you visit Spain, skip San Fermín and head to the city of Teruel for this more familiar and memorable festival. To see more images go to lorineedleman.com. Thank you veteran vaquillera Amparo for her expertise.